a little bit about travel, a little bit about food, a lot of everything in between; as seen, tasted and experienced by different points of view..
Close to 20 years ago, I remember sharing my mornings and afternoons with my sisters watching The Lion King. The animated film that propelled Disney to make numerous animated films that young people and adults come to love. So when the International play came to Manila, dreimart who happened to be another die-hard fan of the film, watched the play at Solaire Resort. It was a whirlwind of a day because he came and left Manila just for that play. 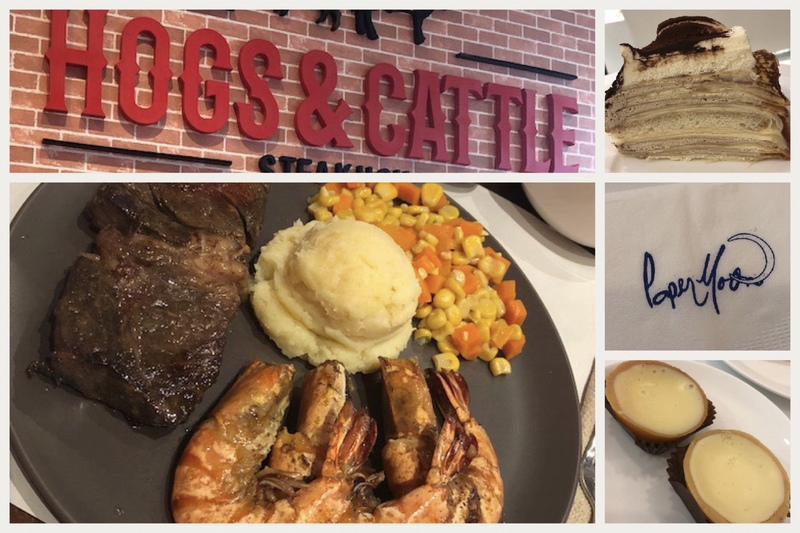 Before we watched the play though, we had to fill our tummies with steak treats and what better place than Hogs and Cattle. This restaurant is located at ground floor of SM Mall of Asia Entertainment Complex, near the bay area. They offered Wagyu All You Can for 899 a pop! Yes, you read that right. Wagyu. All. You. Can. Plus, the side dishes came in unlimited servings too, but I doubt that anyone will be eyeing that. They also have the option to get their surf and turf, that’s their wagyu and prawns set, which is unlimited too, btw. I chose the Wagyu and Prawns, with a side of Mashed Potato and Corn and Carrots. Oh and they had Mushroom Soup too! I remember pouring it on the steak haha! Looking back, I had the first plate full of course.. the next 2 plates, no more sides, haha! Noticeably, they served the next steak cuts in smaller portions, and I really appreciate that. The steak was soft and tender and perfectly seasoned. Mine was a medium well or was that a medium? The cook on my steak was better and more tender than dreimart’s I can’t remember why though haha maybe the steak had gone to my brains. While the warm, fresh new steak pounds were nestling in our stomach, we walked around the complex looking for a cafe I first saw in Shangri La. PaperMoon Cafe is a Japanese dessert cafe known for their mille crêpes so I ordered their Tiramisu Mille Crêpe and a pair of Cheese Tarts like we needed more carb pounds for our stomach to carry. LOL the “thousands of crêpes” dessert was a flop for me. It didn’t scream tiramisu for me, and I am not sure but there really was a chiffon slice in between. The taste was bland and lacked the coffee and cocoa flavor. The cheese tart was so-so, had better, and we just had to taste it because it’s a Japanese cheese tart! I was almost expecting it to have that cheese punch but it hardly took off for me. Just come to H&C prepared. You need all the stomach space you can spare and all the courage to finish all those steak plates flying off from their kitchen. For the all you can eat price, it’s a steal. And unfortunately, I chose badly with Paper Moon. I wanted a different taste from state in my mouth and this didn’t help at all. Oh and I hope you didn’t expect this to be a Lion King review!